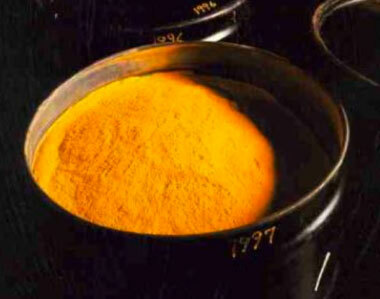 Uranium(VI) oxides or "yellow cake" is an intermediate step in the processing of uranium ores. The use of uranium in its natural oxide form dates back to 79 A.D. when it was used as a yellow coloring agent in ceramic glazes. Yellow glass with 1% uranium oxide was found in an ancient Roman villa near Naples, Italy. In the late Middle Ages, pitchblende was extracted from the silver mines and was used as a coloring agent in the glassmaking industry. The identification of uranium as an element is generally credited to Martin H. Klaproth. While experimenting with pitchblende in 1789, he concluded that it contained a new element, which he named after the newly discovered planet Uranus (named after the Greek god of the sky or heaven). What Klaproth actually identified was not the pure element but uranium oxide. The pure metal was first isolated in 1841 by Eugène-Melchior Péligot, who reduced anhydrous uranium tetrachloride with potassium metal. In 1896 Antoine H. Becquerel discovered that uranium exhibited invisible light or rays; it was radioactivity. In 1934 research by Enrico Fermi and others eventually led to the use of uranium fission in the first nuclear weapon used in war and later in the peaceful use of uranium as fuel in nuclear power production. An ensuing arms race during the Cold War between the United States and the Soviet Union produced tens of thousands of nuclear weapons that used uranium metal and uranium-derived plutonium-239. The security of those weapons and their fissile material following the breakup of the Soviet Union in 1991 is an ongoing concern. In 1972 French physicist Francis Perrin discovered ancient and no longer active prehistoric natural nuclear fission reactors in uranium ore deposits at the Oklo mine in Gabon, West Africa, collectively known as the Oklo Fossil Reactors. The ore deposit is 1.7 billion years old; at that time, uranium-235 constituted about 3% of the total uranium on Earth (0.72% today). This is high enough to permit a sustained nuclear fission chain reaction to occur, provided other supporting geologic conditions exist. Uranium is weakly radioactive because all naturally occurring (or primordial) isotopes of uranium (238U, 235U and 234U) are unstable, with half-lives varying between 159,200 years and 4.5 billion years. There are 27 known isotopes of uranium ranging in atomic weights 217–219, 222–240 and 242, with half-lives of from billions of years to a few nanoseconds. Naturally occurring uranium consists of three major isotopes: 238U (99.28% abundance), 235U (0.71%), and 234U (0.0054%). (The US DOE has adopted the value of 0.711 as being their official percentage of 235U in natural uranium.) All three isotopes are radioactive, with small probabilities of undergoing spontaneous fission but preferentially decaying by alpha emission. The half-life of uranium-238 is about 4.47 billion years and that of uranium-235 is 704 million years, making them useful in dating the age of the Earth. It also suggests that half of the uranium that existed from the formation of the Earth has decayed to other radioactive elements and eventually to stable elements. Much of the internal heat of the earth is thought to be attributable to the decay of uranium and thorium radio-isotopes. Uranium-238 is an α-particle emitter (occasionally, it undergoes spontaneous fission), decaying through the "Uranium Series" of nuclear decay, which has 18 members, all of which eventually decay into lead-206, by a variety of different decay paths. The decay series of 235U, which is called the actinium series has 15 members, all of which eventually decay into lead-207. The constant rates of decay in these decay series make the comparison of the ratios of parent to daughter elements useful in radiometric dating. Uranium-234 is a member of the "Uranium Series", and it decays to lead-206 through a series of relatively short-lived isotopes. Uranium-233 is made from thorium-232 by neutron bombardment, usually in a nuclear reactor, and 233U is also fissile. Its decay series ends with thallium-205. Uranium is the heaviest naturally-occurring element available in large quantities. The heavier “transuranic” elements are either man-made or they exist only as trace quantities in uranium ore deposits as activation products. Uranium occurs naturally in low concentrations of a few parts per million in soil, rock and water, and is commercially extracted from uranium-bearing minerals. Uranium, not as rare as once thought, is now considered to be more plentiful than mercury, antimony, silver, or cadmium, and is about as abundant as molybdenum or arsenic. It occurs in numerous natural minerals such as pitchblende, uraninite, carnotite, autunite, uranophane, and tobernite. It is also found in phosphate rocks, lignite, monazite sands, and is recovered commercially from these sources. The United States Department of Energy purchases uranium in the form of acceptable U3O8 concentrates. This incentive program has greatly increased the known uranium reserves. Pure uranium is a silvery white, weakly radioactive metal, which is harder than most elements. It is malleable, ductile, slightly paramagnetic, strongly electropositive and is a poor electrical conductor. Uranium metal has very high density, being approximately 70% denser than lead, but slightly less dense than gold. Uranium metal exhibits in three crystallographic modifications: alpha --> (688°C) --> beta --> (776°C) --> gamma. Uranium is pyrophoric when finely divided. It is a little softer than steel and is attacked by cold water in a finely divided state.In air, uranium metal becomes coated with a layer of oxide. Acids dissolve the metal, forming the +3 oxidation state which oxidizes rapidly by water and air to form higher oxidation states. Uranium metal is unaffected by alkalis. Uranium metal can be prepared by reducing uranium halides with alkali or alkaline earth metals or by reducing uranium oxides by calcium, aluminum, or carbon at high temperatures. The metal can also be produced by electrolysis of KUF5 or UF4, dissolved in a molten salt mixture of CaCl2 and NaCl. High-purity uranium can be prepared by the thermal decomposition of uranium halides on a hot filament. Uranium metal reacts with almost all nonmetallic elements and their compounds, with reactivity increasing with temperature. Hydrochloric and nitric acids dissolve uranium, but non-oxidizing acids other than hydrochloric acid attack the element very slowly. When finely divided, it can react with cold water. In air, uranium metal oxidizes and becomes coated with a dark layer of uranium oxide. Uranium forms a variety of alloys and compounds with the most important oxidation states being uranium(IV) and uranium(VI), and their two corresponding oxides are, respectively, uranium dioxide, UO2 and uranium trioxide, UO3. Besides the oxides, other Important uranium compounds include fluorides, chlorides, bromides, iodides, carbonates, hydrides, carbides, nitrides, phosphates, etc. At room temperatures, uranium hexafluoride, UF6, has a high vapor pressure, making it useful in the gaseous diffusion process used to separate the rare U-235 from the common U-238 isotope. Uranium hydrides, nitrides and carbides are relatively inert semimetallic compounds that are minimally soluble in acids and have been used as stable fuel pellets in nuclear power reactor technology. Uranium exists in aqueous solutions in the +3, +4, +5, and +6 oxidation states. Oxidation state +6 as the UO22+ ion (yellow in color) is the most stable state in solution. Uranium in the +5 state as the UO2+ ion is colorless, quite unstable and disproportionates (reacts with itself) to form the +6 and +4 states. The +4 state (green) is reasonably stable in solution, but the +3 state (dark green or dark red depending on the illumination source - daylight vs fluorescent light) is unstable and easily oxidizes to +4. The +4 state in near-neutral pH solutions readily hydrolyzes to form black oxy-hydroxide precipitates. Uranium was used in as coloring agents in ceramic glazes and glass in ancient Rome and in the Middle Ages producing orange-red to lemon yellow hues. More recently it was used as an orange glaze in contemporary Fiestaware© dishware but was later discontinued for health reasons. Many contemporary uses of uranium exploit its unique nuclear properties. Uranium-235 has the distinction of being the only naturally occurring fissile isotope. This means it can be split into two or three fragments (fission products) by thermal neutrons. Uranium-238 is fissionable by fast neutrons, and is fertile, meaning it can be transmuted to fissile plutonium-239 in a nuclear reactor. Another fissile isotope, uranium-233, can be produced from natural thorium and is also important in nuclear technology. While uranium-238 has a small probability for spontaneous fission or even induced fission with fast neutrons, uranium-235 and to a lesser degree uranium-233 have a much higher fission cross-section for slow neutrons. In sufficient concentration, these isotopes maintain a sustained nuclear chain reaction. This generates the heat in nuclear power reactors, and produces the fissile material for nuclear weapons. This nuclear conversion can be brought about in breeder reactors where it is possible to produce more new fissionable material than the fissionable material used in maintaining the chain reaction. Depleted uranium (238U) (depleted of uranium-235) is used in balistic armor penetration and as armor plating. Uranium-238 is not fissile, but is a fertile isotope, because after neutron activation it can produce plutonium-239, another fissile isotope. Indeed, the238U nucleus can absorb one neutron to produce the radioactive isotope uranium-239. 239U decays by beta emission to neptunium-239, also a beta-emitter, that decays in its turn, within a few days into plutonium-239. 239Pu was used as fissile material in the first atomic bomb detonated in the "Trinity test" on 15 July 1945 in New Mexico. Natural uranium, slightly enriched with 235U by a small percentage, is used to fuel nuclear power reactors to generate electricity. Natural thorium can be irradiated with neutrons to produce the important isotope 233U as follows: 232Th(n, gamma) --> 233Th(beta) --> 233Pa(beta) --> 233U. While thorium itself is not fissionable, 233U is, and in this way may be used as a nuclear fuel. One pound of completely fissioned uranium has the fuel value of over 1500 tons of coal. The uses of nuclear fuels to generate electrical power, to make isotopes for peaceful purposes, and to make explosives are well known. Uranium in the U.S.A. is controlled by the U.S. Nuclear Regulatory Commission. New uses are being found for depleted uranium, i.e., uranium with the percentage of 235U lowered to about 0.2%. Uranium is used in inertial guidance devices, in gyro compasses, as counterweights for aircraft control surfaces, as ballast for missile reentry vehicles, and as a shielding material. Uranium metal is used for X-ray targets for production of high-energy X-rays; the nitrate was once used as a photographic toner, and the acetate was once used in analytical chemistry. Crystals of uranium nitrate are triboluminescent. Uranium salts have also been used for producing yellow "Vaseline" glass and glazes. Uranium and its compounds are highly toxic, both from a chemical and radiological standpoint. Finely divided uranium metal, being pyrophoric, presents a fire hazard. In nature, U(VI) forms highly soluble carbonate complexes at alkaline pH. This leads to an increase in mobility and availability of uranium to groundwater and soil from nuclear waste repositories which leads to health hazards. Working with uranium requires the knowledge of the maximum allowable concentrations that may be inhaled or ingested. Recently, the natural presence of uranium in many soils has become of concern to homeowners because of the generation of radioactive radon gas and its daughters particularly in confined spaces with low circulation such as basements.